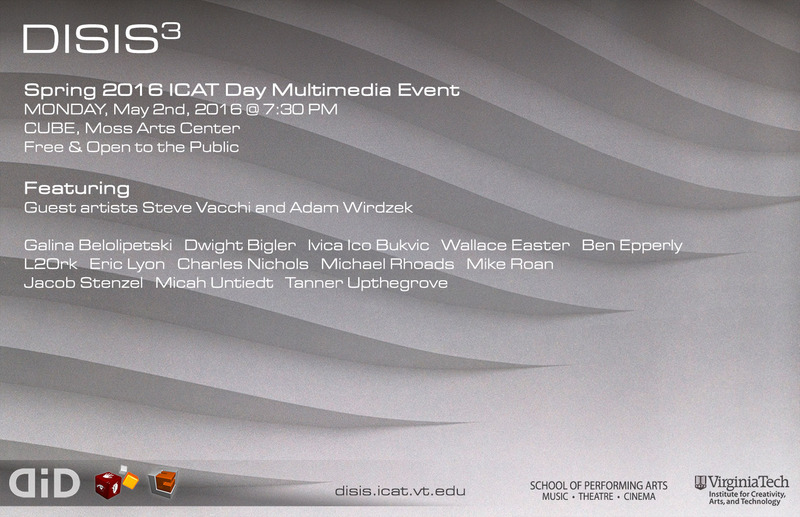 As part of the ICAT Day, VT Institute for Creativity, Arts and Technology (ICAT) and School of Performing Arts' Digital Interactive Sound and Intermedia Studio (DISIS) presents aconcert of interactive computer music and fixed media, featuring performances by guest bassoonist Steve Vacchi, computer musician Adam Wirdzek, faculty horn player Wallace Easter, and the Linux Laptop Orchestra (L2Ork), pieces by faculty composers Ivica Ico Bukvic, Eric Lyon, and Charles Nichols, and student composers Galina Belolipetski, Ben Epperly, Michael Rhoads, Jacob Stenzel, and Tanner Upthegrove, and collaborations with faculty choral director Dwight Bigler and the Virginia Tech Chamber Singers, Engineering faculty Mike Roan, and Cinema student Micah Untiedt. "Digital iD" offers an exploration of synergies among music, technology, arts, gesture, collaboration, interactivity, and ultimately community. The event is free and open to the public.